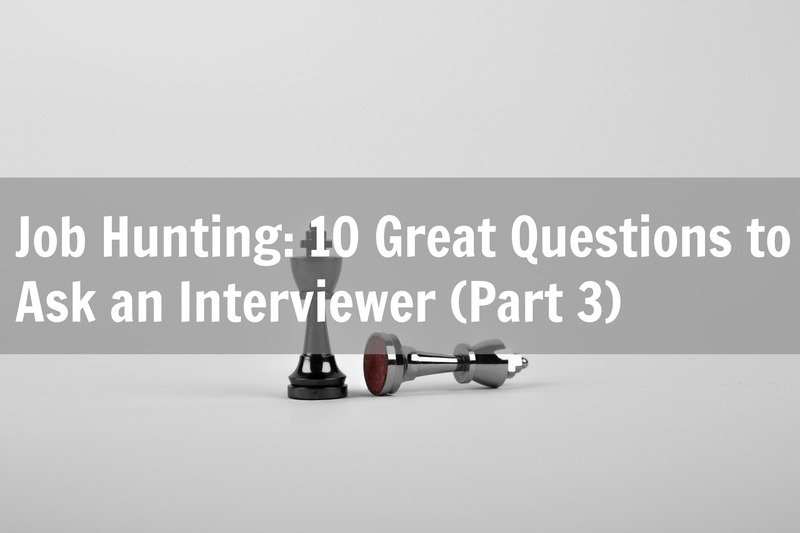 This is the final portion of the “10 Great Questions to Ask an Interviewer” series. Part 1 can be viewed here, and Part 2 can be viewed here. As has been demonstrated, truly insightful questions can help you make up your mind about the potential employer. 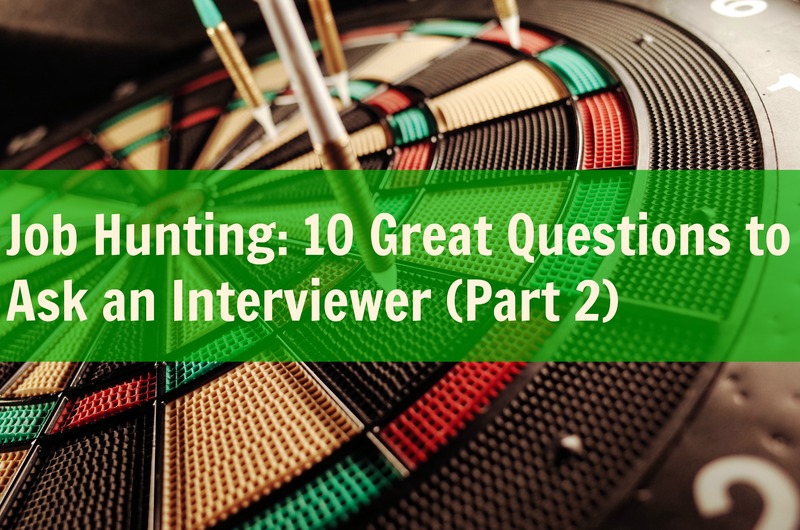 These questions display ambitious traits, alert you to potential issues, and give the interviewer more confidence to make a positive decision on you. In the last of this series, we will look at some generic questions and introduce a few project-specific questions. What accomplishments is this team/department most proud of?This is an excellent way to get the interviewer to open up about the company, the team, or the department. Look for enthusiasm from the interviewer; blank stares are not a good sign. Where do you see the company in 3, 5, or 10 years?This will help you see what the long-term prospects are with the company and whether they have a great go-to market plan, whether they fly by the seat of their pants, or whether they are clueless. What are your most successful people doing?This question will identify whether they have successful people, what they do, and if this is a career path for you. What are the prospects of this organization being acquired?This is one of those questions that requires your full attention. Save it for the most senior staff involved in the interview process. Lower level interviewers will frequently not know the answer to this question.However, top-level management may have real insight to the likelihood of this occurring. The key here is to watch them very closely. Evasive answers accompanied by touching of the face or hair likely means that they know the answer, but do not wish to tell you. That will let you know where you are actively, or soon to be in the market. They might also tell you the full plan to be acquired. Mergers and acquisitions can be fraught times for the staff. Depending on your level and whether they provide stock options, acquisitions can be lucrative. How long have you worked here?The answer to this will give you an insight as to whether the person really knows the company well over a long term basis. If they are newcomers like yourself, do some extra digging; is this an entirely new team? If so, why? How does this positions help your department achieve its goal?This will show you how the role fits into the department, and whether this is a key, support, worker bee role, or any other variation. It may also demonstrate how important this role is to the depart of the project. What stage or phase of the project are you at?This can apply to many industries – but not all. Dependent on your skills, most people are looking to join a project at the beginning and see it through. Your skills may mean that you do not usually join a project until midway through. That is all for you to decide. The key here is, if you would normally join in at the start, why are they looking for someone during this phase? If this is the case, dig deeper. Do you see yourself retiring here?This is one of the only questions that is not posed as an open question – open questions were discussed in Part 1 of this series. This is a straight yes or no question. If yes, it says that this is probably a great place to work long term. If no, you will want to find out why; either answer could be good or bad. What is the company culture like?Another excellent question that will help you make up your mind. Some companies are very uptight, others are more formal and more are very relaxed. Dependent on your own personality, you may suit one better than another may. What else can we discuss that would help you make up your mind about me?The answer to this could be practically anything. However, the question shows the Interviewer you are genuinely interested in the job and open to discussing all topics to help put you in a better light. Over the course of the last three weeks we discussed 30 different questions an Interviewee could ask an Interviewer. This should provide you with a battleship or arsenal, should the opportunity present itself. However, if none of these suit you, feel free to give Global Healthcare IT, Inc. a call at 562 508 4040, or email us at info@globalhit.com to discuss your predicament. Our upcoming series, “Job Interview Advice: Great Questions to Ask a Candidate” will also be a weekly set of questions answered over the course of three weeks. Keep up to date with us by coming back! Primary contributors: Rowena Similar, Recruiter, Global Healthcare IT, Inc., Seth Hill, Recruiter, Global Healthcare IT, Inc., Brett Walker , Principal Account Manager, Global Healthcare IT, Inc., Bettsy Farias, Business Analyst, Global Healthcare IT, Inc.
How do I maximize my rate as a Healthcare IT / EMR/ Epic /Cerner Consultant/ Contractor? The secret to maximizing your pay rate as a healthcare IT consultant is to remember the basic fundamentals of economics—that is, supply and demand. The more in demand your skill set… and the less common your skill set... the higher your pay rate. Remember, however, that uniqueness of skill is not sufficient to demand high pay, UNLESS the skills are also needed by employers. As a healthcare IT recruiter, I find that certain backgrounds are harder to find. For example, some Epic Certifications are less common than other Epic Certifications. While there are many people who have certification in Epic Ambulatory, there are very few who have certification in Epic Kaleidoscope. Granted, the former is in greater need throughout the market place, while the latter is a much smaller need, given its niche focus. This is where one must weigh scarcity of skill set with overall demand. The idea is to find that “magic” spot where your background is scarce but also needed—this brings us to trends. Consultants who stay on the cutting-edge of hospital trends will best assess future needs and can plan accordingly. Maybe you learn through research that many hospitals are planning to increase their focus on ophthalmology. In that case, it may behoove you to gain that Epic Kaleidoscope certification. If your theory proves correct, you may find yourself a needle in a haystack—which for you, means money, money money! Of course, there’s not perfect science to predicting the future and nobody has a crystal ball. But the more you stay current with such trends, the better prepared you are to plan for a future that will afford the highest pay. Another factor to consider when trying to maximize your pay rate is that of specialization. In general, the professional who is an expert in a certain skillset will find herself better payed than the proverbial, “Jack of all trades.” As a healthcare IT recruiter, I speak to job-seekers daily who have a multitude of good skills but lack excellence in any one skill. I find myself trying to find the right job for such an individual, but he or she never quite fits into any of the roles. It’s a perpetual case of, “close but no cigar.” Employers seek excellence and specialization—in all industries. However, this is even more critical in terms of the fast-moving—and expensive—world of technology. Learn your skillset, get the education and put it to use effectively—with results that can be documented. If you follow those steps, you will soon find yourself in demand, and the pay will follow. In the previous paragraph on specialization, I allude to “education.” Depending on your IT specialty, education can mean different things. However, generally speaking, it means acquiring universally-recognized certifications. This is particularly the case in the world of Epic EMR. On any given day, I may be working on half a dozen Epic job opportunities. And, on any given day, half a dozen of those opportunities require Epic Certification. Get the picture? Except in rare cases, the certifications and education matter. Admittedly, there can be some differences with other technologies, and there are times where certifications are less relevant. But the general rule of thumb to follow should be to obtain an industry-recognized certification for any given technology whenever possible. A final strategy to consider when trying to maximize your pay rate as a contractor—and this is a long-term effort—is to take steps toward entering management. Sometimes this can happen through your normal course of work. In a typical scenario, you might start as an Applications Analyst, prove yourself through hard work and then gain promotion into a “lead” or “senior” role. I realize this is common knowledge and not necessarily a secret. However, a motivated IT professional can also work toward entering management by way of a more deliberate plan-of-action. For example, Certified Project Managers are among the highest paid consultants that I come across in the industry. When someone combines a technical background with proper certification and Project Management credentials, he or she becomes quite a force. In order to really gain the credentials that command the biggest money, the technical experience and Project Management experience should be combined with a MBA or advanced degree. If a hospital client comes to me asking for a seasoned Project Manager to help with a new EMR implementation, the top things I’m looking for are technical background, experience, Project Management Experience and advanced degrees. Once an IT professional reaches this level of his or her career, the sky is the limit in terms of pay. What should the interview process look like for an EMR Contractor and/or a hospital FTE /permanent / employee? While the interview process can vary somewhat from organization to organization, applicants can typically plan for a general process that follows a certain path. First, contractor/consultant interviews are usually quick and to-the-point, with less focus on finding a “fit” in terms of company culture, etc. They tend to be more focused on technical ability. Obviously, meshing with the team is always important—and it’s more important when looking at longer contracts—but it’s not the same as when an organization is hiring for a permanent, full-time employee that is slated for years of tenure. As a contractor/consultant, one should plan for an initial phone interview followed by a Skype or onsite (final) interview. It should be noted that many organizations are now opting for a phone interview followed by a Skype interview, as opposed to having the applicant come onsite. Sometimes an offer may be extended after just one phone interview, depending on the urgency and length of contract. The hiring process for permanent positions usually involves more careful scrutiny of candidates, since the commitment is considered more long-term. Applicants engaged in this screening process should plan for an initial phone interview from either an HR representative or the hiring manager. This first communication is usually technical-focused and is designed to ensure that the applicant has the necessary experience, credentials and knowledge. After that, qualified candidates will typically be asked to engage in a panel interview with the hiring manager and other team members. This can be by phone, Skype or onsite (in-person). 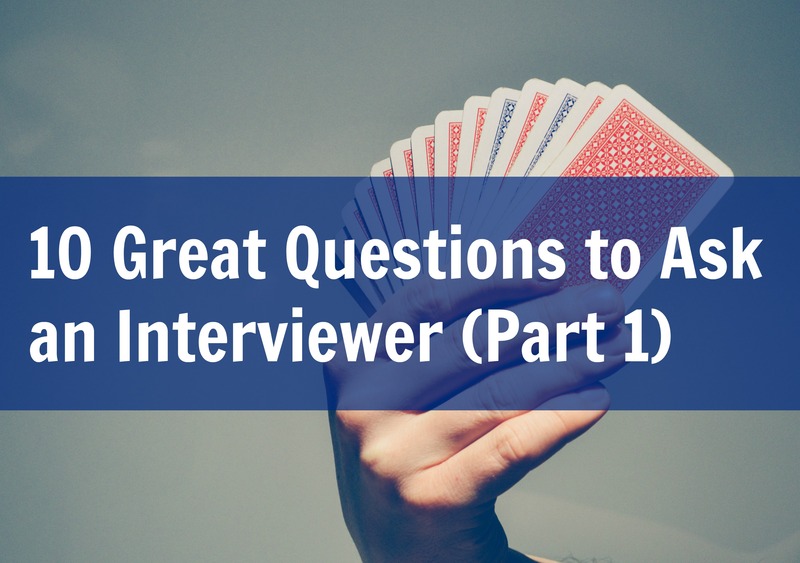 Such an interview may also involve technical questions but will also focus on personality, company culture, communication, ability to work within a team, etc. Often, this is the final interview, in which case it’s usually onsite or through Skype. If it’s not the final interview, a third meeting usually scheduled. By the time an applicant reaches a third interview, a job offer is very likely, and it may done as more of a formality. The idea is to put a face-to-the-name, ensure the candidate understands business etiquette, etc. However, this should not be assumed, and applicants should always consider every meeting an “interview” until they receive a written job offer. Please note that the interview process for both consultants and permanent hires can, in some cases, involve a written or electronic assessment. These are usually specific to the relevant technology skill set and are often administered after the first phone screening by an HR representative. Although not the norm, candidates should be mentally prepared for such an exam and should not let it intimidate them. Often times candidates do much better than they would expect and, as in any test, a perfect score is usually not expected. As long as the candidate possesses the skills that are claimed on the initial application, he or she usually performs just fine. What are the top 10 benefits of using a healthcare IT staffing agency to find a permanent/FTE role in a hospital IT department? In general, there are several tactical advantages to using a specialized healthcare IT staffing agency over applying directly to a hospital job through their corporate website. 1. As a person looking for an FTE or Permanent role, one of the main disadvantages to applying through the hospital's own website is that you run the risk of putting your resume into a virtual "black hole." Frequently, people who put resumes into a hospital's corporate website never get an interview or receive quality feedback that can help their job search in the future. 2. As many of the largest hospitals are frequently looking for a wide selection of employees, the first person reviewing your resume may be dealing with many, widely varying opportunities that the hospital has open. This means that they are more likely to miss the relevance of your healthcare IT specialist skills. Thus, denying you an opportunity. 3. You may be looking for a salary that is just outside the top of the hospital IT departments range. 4. 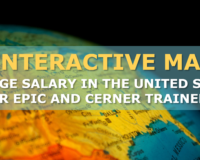 Your salary expectations may be well below the hospital's usual annual salary for that position. This acts as a red flag to the HR department, who may question your depth of skills. By using a knowledgeable, industry specialized Recruiter, you can avoid both #3 and #4. 5. A good Agency/Recruiter will be able to maximize your salary potential. 6. They will be able to advise the hospital to take a look at your resume even if your salary requirements are too high, or you are an 85% fit for the role. Provided that they believe you will ultimately be an asset to the organization. 7. The cost of using an Agency/Recruiter is born by the hospital, and therefore, personally costs you nothing. 8. A great agency will be capable of reviewing your resume, bringing to your attention any errors, a need for clarification, formatting issues, what should be listed first, in the middle or last, where your skills don’t match the position's need, what certifications should be listed, how to write a summary that speaks to the Healthcare IT Director/CIO, and any other pertinent information that would prove valuable to your job search. In short, a great agency will show you how to present yourself in the best light. 9. A good, well-informed Agency/Recruiter will be aware of numerous FTE/permanent opportunities. Many of them are listings that you would not find on your own but could be your ideal position. 10. You will be well-informed on multiple positions, opening you up to making the best choice for your future. Edited by Mike Williams, CEO, Global HIT. What are the top 12 reasons a Contractor or an Independent Consultant should use a Specialized Healthcare IT Staffing Agency to work at a hospital? There are some huge advantages for Contractors and Independent Consultants using an agency/recruiter over going directly to work in a Hospital IT department. 1. The agency will be in continuous contact with many great hospitals and healthcare systems. Something that would be difficult for an individual to do. 2. The agency will know what healthcare IT, EMR, data analytics projects are coming available, when they will need staff , and for how long the project will last. 3. The agency will know the maximum and minimum rates and can advise when you are falling outside of these to make you competitive with other Contractors applying for the role. 4. Furthermore, a great agency/recruiter will have cultivated a strong relationship with the end client hospital. This may mean that they have exclusivity on roles, or can ask a client to take a first look at a particular resume. 5. Similarly, as an Independent Consultant, you may not be able to get corporate rates at hotels, car hire, or be able to maximize your flexibility on the expense policy. Whereas your agency will know this back to front, and can help achieve the best situation for yourself. 6. Should you get a direct contract at a hospital, the rate may be a little better but some hospitals have horrible Accounts Payable departments and processes. We are aware of numerous contractors receiving no pay or reimbursement of expenses for upwards of 6 months. If you have the cash flow, this will not be a problem but many people struggle to last 6 months unpaid. 7. A well run Agency will also have health benefits plans where W-2 employees and occasionally, Corp to Corp staff can opt in. This may be cheaper than anything you could get through your local ACA exchange. 8. Longer term W-2 employee contractors may be eligible to participate in the agency’s 401k plans. 9. Your agency can keep you up to date legislation and mandatory tax changes. 10. With a rate sensitive client, your agency can tell what is the maximum rate, not to price yourself out of the market. 11. Where issues arise at a client site such as: "not the job you were interviewed for," "the project lacks direction," or "the role doesn’t match my skills," a great agency will have quality assurance protocols in place to pick this up at an early stage and endeavor to resolve the matter, or find you a more appropriate new role. 12. Finally, a proactive agency will know proactively, that a contract is coming up for renewal and will be able to negotiate the extension, well in advance of the end of the contract reducing stress and maintaining continuity. If the project is ending, the agency will let you know so they can help you get a new job and provide you with enough time to check other options in the healthcare IT market. Thus, allowing you to avoid expensive lapses between contracts. There are a lot of consulting agencies or firms that one can choose from to help with their next career move. However, not all agencies have your best interest in mind. When determining which one of these firms is best to work with, consider these warning signs that illustrate a bad firm that you should potentially avoid. 1. How much information will they share with you? a. The agency or firm doesn’t know the answer. b. The agency or firm has a weak relationship with the client hospital. c. They fear the competition will contact the client and do a better job than them. d. They don’t have a signed contract with the client hospital and are angling to win one (using you as the bait). A reputable firm will always keep you well informed with these details from the start of your interaction with a professional Recruiter. 2. Does your Recruiter know what they are talking about? Another sign of an unprofessional agency or consulting firm is when your Recruiter does not know anything about the application, the job, or the latest moves within the healthcare IT industry sector. It is always best to work with an agency whose Recruiters actually take the time and initiative to learn about the application, the market sector, and the clients that they work with. You will likely lessen your chances of finding employment with a Recruiter who does not at least know the basics about your craft. Those people will submit you to poorly matched jobs, wasting your time, the client’s time, and ultimately, their own time. 3. Submitting you resume to clients without your permission. This is one of the biggest red flags. If your recruiting agency or consulting firm submits your resume to a client without firstly informing you, that is a terrible sign. This vastly increases the likelihood of dual or multiple submission. Hospitals hate receiving the same resume two times or more as it makes their job harder. It increases the probability of the client simply rejecting your candidacy, as they do not wish to resolve who correctly sent in the resume. It makes both you and the agency or firm look unprofessional and decreases your chance of getting a job. You should always be informed of where your resume is being sent before it is actually sent out. Good agencies and consulting firms will provide you these details and send you a submission confirmation. These confirmations make it easier for you to track where and when your resume was sent out and who gets the best results on resume to interview ratios. Over time your will be able to identify the most successful agencies and firms yourself. 4. Credit reference your agency or consulting firm. A company with stellar credit is always better to work with. They are going to reliably pay your hours worked and your expenses. A new or poorly run company may have very weak finances. Nobody wants to work for a few months to receive no pay! Therefore, if you can, run a DNB credit report on the firm or ask the firm to provide you with a copy of their own credit score. Good companies will have no problem doing this. 5. Does the agency or consulting firm have competent quality assurance processes? If any of these points are apparent within a future, or current agency with whom you are working, where possible, end your ties with them immediately. It will only benefit you to find a new, more sophisticated, and experienced agency. In the long run, following this advice will improve your own ability to identify and land a stable, well paid, and secure position. Edited by Michael Williams, CEO, Global Healthcare IT, Inc.
What are the 12 best ways to prepare for a face to face interview with a hospital IT department? 1. Research the hospital and its IT department activity the night before so it’s fresh in your head and write down any questions you may want to ask. Check out the hospital website. Look for news articles mentioning the software you know and the hospital IT department. See whether they have a company page on LinkedIn. 2. Re-evaluate the role/ job description to make sure you know all of the points on the job description. This is a good time to ensure you meet most, if not all, the requirements. It also allows you to prepare an answer for areas you still need training in. Clients seldom look for a 100% fit for FTE staff, and as long as they know your training requirements, they can often accommodate. 3. Print a fresh, clean copy of your resume to take with you to the interview. Make sure it is completely up to date, and that dates match any online profile you may have posted (especially LinkedIn). 4. Look up the location well in advance of your travel. Calculate the usual travel time using google maps or similar. Then, add a margin of error to this calculation. The day to the interview check traffic updates to ensure you do not need to add in more time. The goal is to arrive to the interview a little early (you can always grab a coffee, or catch up on email). Definitely try to avoid arriving late. Should this begin to occur during your journey, update the client ASAP. Keep them updated until you arrive. 5. At a face to face interview, you only get one chance at a first impression, so dress professionally. I suggest use of solid colors. These are simple, but elegant. Do not dress in anything you think will be a distraction. 6. When you greet the person you are interviewing with, always look them in the eye, have a smile, and a nice firm handshake. 7. Eye contact and clear communication is important throughout the interview. 8. Where possible, let your personality come out, and look to build rapport with the person you are interviewing with. 9. When the interviewer asks about your history, don’t go too far back only speak of relevant work experience pertaining to the job you are interviewing for. 10. From the research suggested in answer 1., have a few valid questions ready to ask the Interviewer. Focus these on the project, the hospital, and the work itself. 11. Never bring up pay or benefits or schedule in the first interview. The first interview is to see if it’s an all around fit. Bringing this topic up too early might turn off the interviewer. 12. End the interview with interest in the position, and ask what the next steps might be.